Don’t worry, we’ve seen your tips hit our inbox. 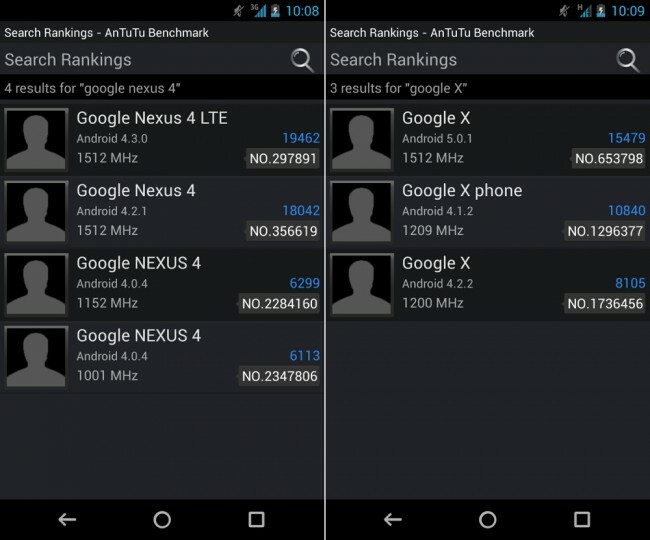 We are well aware that benchmarks for devices named “Google Nexus 4 LTE” and “Google X phone” are appearing through apps like AnTuTu. We also know that both have been rumored off and on over the last couple of months as potential Google I/O launch devices. But pardon us if we aren’t buying into these benchmarks being legit or giving us any reason to call anything as “confirmed.” Let me explain. We’ll start first with the “Google Nexus 4 LTE,” since it’s the newest device to make internet rounds. After a couple of unconfirmed and “weird” rumors for this device floated about last week, a supposed benchmark from it is now available, leading some to report that this device along with Android 4.3 are confirmed. (Nice timing!) 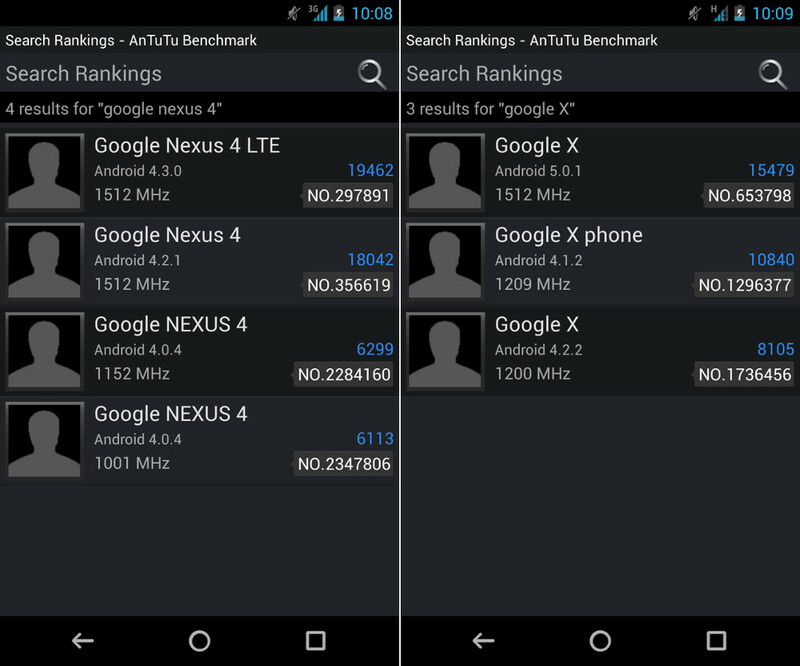 Funny thing is, if you actually own a Nexus 4 with stock Android (like I do), and run an AnTuTu benchmark, the device isn’t called “Google Nexus 4.” No, AnTuTu knows the name as “Nexus 4” only. In fact, if you do an AnTuTu search for “Nexus 4,” you’ll get dozens of results back from real devices, but if you limit it to “Google Nexus 4,” you get four results of devices that may not even be the Nexus 4 (all pictured above to the left). Two are clocked properly at 1.5GHz, while the other two are are running Ice Cream Sandwich and who knows what kind of processor. First, we know that Motorola is working on new phones – execs from Google have admitted this time and time again. Do we know that one of them will be called the “X Phone”? No. Sure, we’ve seen a job listing for the project from Motorola with X Phone mentioned, but if anything, that’s a code name (or a troll job by Google), which typically do not show up on benchmarks. Second, it’s clear that someone tried to create these results just to stir the pot. We’ve got phones with varying processors, three different versions of Android, and one even going as far as to use the word “phone” in the name. Because phone manufacturers love to use the word “phone” in an official capacity at the end of their naming conventions. Can you imagine if HTC went with the “HTC One Phone”? You get the point. Oh and what about the top result that shows “Android 5.0.1”? We’re pretty sure the next big release of Android is 4.3, not 5.0. You can find a handful of reports who are claiming to have seen Android 4.3 in server logs (we’ve got sightings in our analytics as well), still as Jelly Bean, but nothing on 5.0 and we’re two weeks from Google I/O. If Google were to unveil 5.0, we’d have seen some sort of trace of it by now. In the past, we have used benchmarks to help shape stories and gather details about upcoming phones, but AnTuTu listings of a random phone name with a random version of Android is not a part of that process. If you want to find legitimate results, GLBenchmark is probably your best bet. Motorola is indeed working on new phones, hell, we even have the real codenames for them already. But there are no signs right now that point to Google actually releasing an LTE Nexus 4. We’d love for that to happen, but anything related to it at this point is nothing but rumor. Thankfully, we are two weeks away from I/O and will find out for sure then.